In the Oakland mayor's race, the normally staid Libby Schaaf has come out swinging, while one of her top challengers, the usually brash Cat Brooks, is acting more like a Fortune 500 CEO. 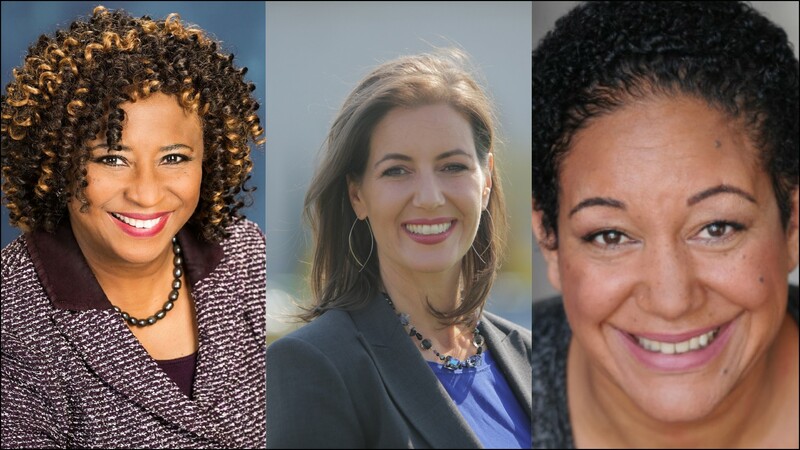 Attorney Pamela Price (left), Mayor Libby Schaaf (center), and activist Cat Brooks (right) are the top candidates in the race. For about 30 minutes, as the field of mayoral candidates took turns ripping her handling of police misconduct and the city's rapidly growing homelessness problem, Oakland Mayor Libby Schaaf looked angry, but declined to take the bait. But then when candidate Saied Karamooz, who has become the harshest critic of the mayor during the campaign, claimed at the candidate forum at Allen Temple Baptist Church last month that Schaaf had attended a number of statewide, national, and international meetings on the environment without bringing home any funding to combat climate change, it was too much for her to bear. Schaaf stood and forcefully said the assertion was untrue (it was). Karamooz sat with a smile. Throughout the campaign, Karamooz and the other candidates have severely criticized Schaaf and her tenure as mayor, which is not unusual, considering that challengers often gang up on incumbents during political campaigns. One of the favorite attacks against Schaaf has been her Tuff Sheds shelter program for dealing with homelessness. And sometimes, the usually calm Schaaf punches back. When she told another group at the state building on Clay Street that she was proud of her Tuff Sheds program, Schaaf was lustily shouted down. "Rip on the Tuff Shed program all you want," she shouted back, "but every person that I have talked to — and I have talked to all of them — appreciates that they are not on the streets." During an interview, when asked about her forceful reactions, Schaaf said, "I'm used to getting criticized. I'm used to being protested. I get angry when people are misled about my record." Just two hours later at another candidate forum, Schaaf used her closing statement to slam her opponents for proffering misinformation about her. The audience, made up mostly of supporters of the other candidates, reacted by shouting at Schaaf, with a number of people standing up and angrily pointing and directing invective at her. But the normally cool, measured Schaaf has also embraced her new feistiness — as evidenced by her new campaign slogan, "Oakland Tough." The mayor, however, is not the only candidate to undergo a metamorphosis this fall. One of her top rivals, Cat Brooks, has transformed from being perhaps the most combative person in Oakland politics and the fiercest public critic of Schaaf to being the one candidate in the race who treats the mayor with kid gloves. In a recent, hourlong interview with the Express, Brooks never once went on the offensive against Schaaf. Brooks' turnaround has been even more pronounced than that of Schaaf. In the last few years, Brooks has been one of the most prominent — and perhaps the most militant — activists in the region, repeatedly leading street protests against police killings of Black people, shutting down city council meetings, locking herself to things, and even camping on the front lawn of Schaaf's home. Brooks, a former actress who has also run nonprofits, now often looks more like the CEO of a Fortune 500 company than Schaaf, the actual CEO of the city, who, by contrast, appears on the campaign trail in business casual attire and even Oakland-themed T-shirts. In a recent autobiographical video, Brooks used a bullhorn to hint at her transformation. "Some people say there's no place for a bullhorn in City Hall," she said in the video, referring to the bullhorn she often used during protests. "They say: 'Turn it down, Cat.' 'You're being too loud.' 'You're running for mayor.' But everything I've ever said through this bullhorn, whether it's been about police violence and public safety, the criminalization of our homeless, the trash on our streets, the quality of our schools, the way we treat women and immigrants, or the massive displacement we are facing, have all been different ways of saying the exact same thing: 'I love you, Oakland.'" There's another hurdle for Schaaf's re-election bid this fall that is reminiscent of the partnership between Jean Quan and Rebecca Kaplan eight years ago that resulted in the stunning ranked-choice-voting upset over former state Senate President Pro Tem Don Perata. Oakland civil rights attorney Pamela Price and Brooks have similarly teamed up against Schaaf and are banking on a repeat of 2010. Price probably envisioned that by this time, she would be preparing to move into the Alameda County District Attorney's office instead of running for mayor of Oakland. Price's insurgent campaign in June against District Attorney Nancy O'Malley put a significant scare into the county's political establishment, but she ultimately fell short by nearly 20 points. Looking inside the numbers, Price noticed sometime in late July that the seeds of a potential mayoral campaign were buried within the DA campaign's electoral data. While O'Malley outpaced Price by a large margin in many of the county's suburbs, Price topped the incumbent in large sections of Oakland. Similarly, Price thinks Schaaf is vulnerable in large swaths of The Town. "There are some people who would say Libby Schaaf is very popular," said Price, in an interview. "In some places, I think she is. In the flatlands, she is not." It's a portion of Oakland that Brooks also hopes to win on Nov. 6. Although Price and Brooks have not always appeared unified in running together as a ranked-choice bloc, in recent weeks they have been increasingly clear about asking voters to choose them first or second on their ballots. Price and Brooks also share similar platforms. Both have long made police misconduct and racial profiling the focus of their activism. Brooks often notes that Schaaf spent her first day in office with Oakland police officers — a move that was deeply insensitive to many African Americans, she said. "We will never forget that," Brooks said. "For people of color, that was a death knell."